The underlying structure of telling a good story. Is there a way to tell a good story? I written about storytelling elements1 before, but how about the over-arching structure of a good story? Well, it turns out that there are quite a few different takes on the subject. 1,462 Stories — or just One? Many intellectuals have been trying to figure out if there’s any typical underlying structures of a good story. However, it would be a stretch to say that many of them have arrived at the same conclusion. Aristotle said that there are only two types of stories, comedies, and tragedies. Jorge Luis Borges argued that there are only four stories; a love story between two people, a love story between three people, the struggle for power, and the journey. Arthur Quiller-Couch stated that there are only seven plots; man vs. man, man vs. nature, man against god, man vs. society, man in the middle, man and woman, man vs. himself. George Polti described thirty-six dramatic situations, including disaster, revolt, deliverance and so on. William Wallace Cook, a “dime writer” known for having written 44 books in a year, outlined a staggering 1,462 plots in Plotto: the Master Book of All Plots. Joseph Cambell went the other way by declaring the monomyth, the one plot on which all great stories are based. 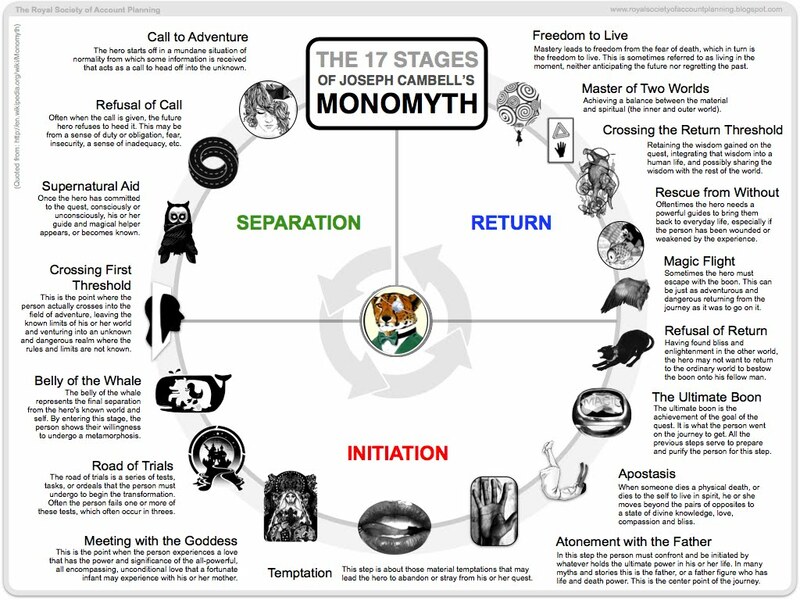 The most famous story arc must be Joseph Cambell’s monomyth, which is also known as The Hero’s Journey. It may be one structure, but it does have three main parts and several stages. The Hero’s Journey is often especially clear in epic and classical stories. This model of The Hero’s Journey instead outlines twelve steps, but is more clear about how the hero must start out in the ordinary world before venturing out in the extraordinary world — only to come back full circle to the ordinary world again. The three act structure is a popular baseline. Depending on which model of The Hero’s Journey you prefer, Act 1 and Act 3 can be said to take place in the ordinary world of the hero, while Act 2 takes place in the special world. Another way of putting it is to say that Act 1 equals the Separation, Act 2 the Initiation, and Act 3 the Return. In this model, Act 1 is the Setup, Act 2 is the Confrontation, and Act 3 is the Resolution. Another way of structuring a story is to arrange it around plot points (where the story makes an unexpected turn) and pinch points (where the protagonist of the story is in a tight spot). Plot and pinch that story. In character-driven stories (as well as in most other stories to some extent), stories are moved forward by how the characters evolve throughout the story. It’s not just about the evolution of the protagonist (the main character), but also of the plots and the other character. This model makes an interesting case of how you can make a story more captivating by having different plots and characters reach “peak chaos” and “problem resolved” at different parts of the story. When is your “peak chaos”? No matter which model you prefer, there seems to be no shortage of ways to structure your story. However, typical for our day and age is that stories needs to be shorter. Many choose movies over books, many choose television episodes over movies, many choose Youtube clips over television episodes, many choose Instagram stories over Youtube clips. But there’s still something to be said about being able to tell a good story; if not just in one tweet or Facebook update, but over time as you build deeper relationships with you followers. In essence, you need an establishing beginning, a struggling middle, and a rewarding end. And — make them all about matters of the heart. So easy, yet still so difficult to master. Even insurance companies can tell stories. In the beginning, middle, and end, storytelling all comes down to matters of the heart. Photo by Rob Potter on Unsplash. See 10 Storytelling Elements, Improve Your Storytelling (in 15 Minutes), and Storytelling for Jedis.